Cloth diapers are an easy way to save money while proving comfort to your baby. See how to change a cloth diaper here. Lots of moms prefer using reusable or cloth diapers instead of disposables, and there are lots of reasons why. For starters, they save you money…you’ll probably only need between 25 and 30 cloth diapers. They’re also really soft and breathable. Before you start, find a clean, flat surface for your changing mat. The surface should be waist high ideally, so you don’t strain your back. Start by laying your baby down on the mat, and unsnap the baby’s onesie. Then, lift the clothes up and out of the way. Undo the outer layer and dirty cloth insert and while holding your little one by the ankles, lift her legs up into the air. You can then use a clean corner of the cloth to wipe away any mess. Put the dirty diaper to one side – out of reach of your baby. You’ll come back to it later. Clean the diaper area, making sure to wipe from front to back if your little one’s a girl. Pat dry with a towel and give your baby a little time to air-dry if you can…before putting on a thin layer of diaper cream to protect her skin from irritants and rubbing. Now, lay a fresh cloth diaper down on the mat. The back edge should be in line with your baby’s waist. Pull the front half up above your baby’s tummy or, fold the front down if the umbilical cord is still attached. That way, the fabric won’t make it sore. 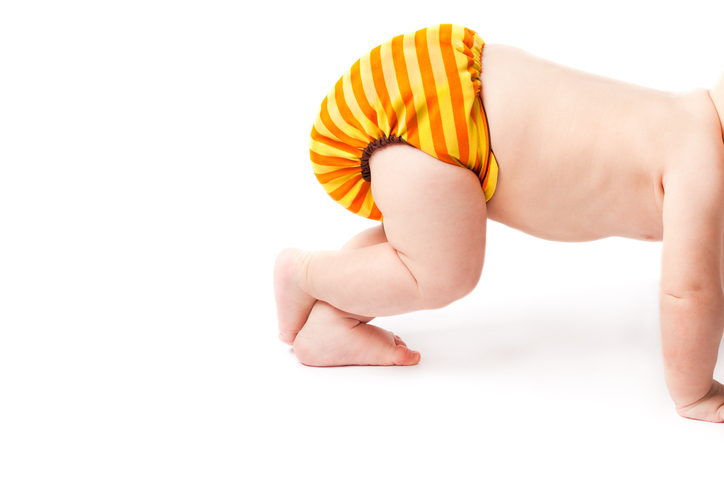 To seal the diaper, pull the back corners around your baby’s waist, and fasten them in the front. There are several different types of cloth diapers – be sure to check the fastening instructions for whichever type of diaper you’re using. If you have a waterproof cover, this then goes on over the top – if you buy a one-piece cloth diaper or a pocket diaper, this will already be attached. Some covers seal with Velcro tabs, while others simply pull on. It’s important never to leave your baby unattended while you’re changing their diaper so, once your baby’s in fresh clothes and somewhere safe, you can go back to the dirty diaper bundle. You’ll need to flush any solid pieces down the toilet, before putting the diaper in a diaper bucket, and shutting the lid tightly. When the bucket is full, you can pop the dirty diapers in the washing machine. And that’s it!